It´s fun to know how strong the city celebrates 5 de mayo, a non significant fiesta for most of the Mexicans, but a great excuse for local people to dive into the bold and spicy flavors of the Southbound neighbor. If anybody thinks that Spaniard cooking and Mexican cooking are similar is totally wrong. In my opinion, because my husband thinks the opposite, but I don´t feel in the same way. It´s true that after the Spanish conquerors some interesting food traveled from Mexico to Europe, like corn and chocolate, and other ingredients made the opposite trip, like rice and almonds. But today, apart from some treats and desserts like flan or churros and other creations as moronga, similar to our morcilla, our two countries cook in a real different way. I´d say that our cooking is much more austere, depending more on the quality of the ingredients and with a range of species and condiments much more limited. And our flavours are much less explosive, I would say. 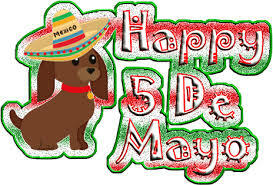 That´s why Mexican cooking is, today a total mistery to me. But I don’t mean the typical tacos, burritos and quesadillas tex mex. I mean the real deal, because in Spain you won´t find Mexican food far away from tortillas, nachos and guacamole seasoning too. I was curious to know more about nopales, these cactus with extraordinary properties, a great deal to keep your blood pressure and sugar levels on track and full of vitamins. So I asked Eugenia, one of my best friends, who kindly organized a guided visit to the Mexican population temple here in the Eastside, La Quemada convinence shop, in Downtown Redmond. The first thing that surprised me was the amazing collection of different spices and herbs that you can find inside. You can choose between 300? different varieties, many of them totally new for me. Of course you have a wide range of dried chiles to choose, like the famous chile de árbol, used for celebrities like Bobby Flay, in every of their dishes. Then, another turnaround to land into chiles paradise, when I found so many varieties… Anyway I finally went classic, choosing serrano peppers. And here it is! Fresh nopalesl! I rounded my shopping cart with some chayotes, pasilla and tomatillos too. Eugenia was happy explaining me how to cook everything. “The nopales need few water and a pinch of salt, or they´ll end really mushy”. Coming back home, I decide to dive a bit into mexican recipes thanks to Saint Google, patron of all the amateur cookers, and I found an interesting salad made with nopales that I reproduce here. Easy to prepare and really bold in flavor. You only need to modulate the use of the serrano peppers and let the onion marinate in salt for an hour if you´re not a super spicy pal. 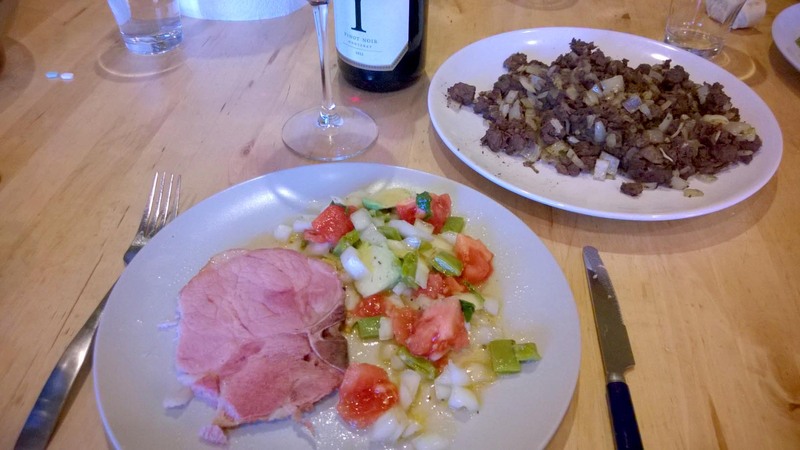 We eat ours as a garnish to the smoked pork chops that I´d bought at La Quemada too. So yes, enjoy your Corona and tacos to celebrate 5 de mayo, but if you feel a bit adventurous, I recommend you a visit to La Quemada to dive into the real deal. 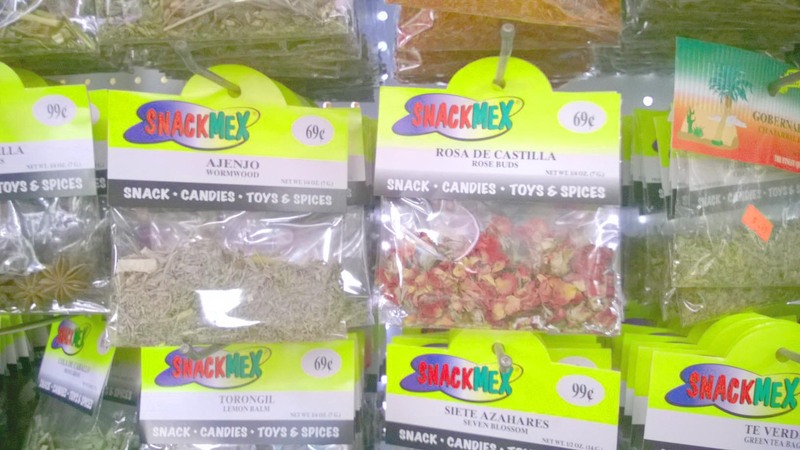 The shop assistants, super nice, will proudly help you to choose the best groceries for your mexican party. Remove the seeds from the tomatoes and chiles. Cut into julienne the nopales, the onion, the tomato and the chiles. Boil the cactus in little salted water until al dente. Place the onion and the chiles in a bowl and add the lemon juice, olive oil, salt, pepper and oregano and let marinate while you cook the nopales. When they are cooked rinse under running cold water, drain them well and place in a bowl. Add the marinated onions and chiles to the nopales. Add the chopped tomato and cilantro and stir everything. Finally add the avocado sliced or minced. You can add panela cheese into cubes too. This nopales salad is great to accompany grilled meat or fish.